A huge selection of power banks, but is Aukey for you? One of the ultimate smartphone accessories is a power bank to ensure your phone won't run out of battery when you're out and about. There's so many to choose from though, so which one do you buy? There's a huge plethora of choices out there from the likes of Anker, Mophie, RavPower and one of the other big name manufacturers you often hear of is Aukey. We've tried out a variety of Aukey products in the past, so we've put together this guide to try and help you decide whether this is the brand you should buy your new battery pack from. Aukey offers a variety of different designs for its power banks ranging from small capacity circular options that can slot into your pocket next to a wallet all the way up to much chunkier and difficult to carry high capacity packs. Aukey usually only offers black versions of its power banks, which is worth noting as other brands like RAVPower or Anker often offer the choice of a white or more colorful option. It's difficult to get excited about the design of a power bank, but the company has managed to shrink its designs a lot in recent years. It's likely if you're buying a power bank from Aukey in 2018 it'll be smaller and more portable than products the company has offered in previous years. Often you'll find the Aukey logo is emblazoned on the top of the device. Some power banks from the company are quite square, especially the larger ones. If you want something that's a touch easier to carry we'd recommend opting for the ones with rounded corners. Have a look at the full range of Aukey power banks before making your decision though - the company has 34 different power banks on its website at the time of writing. These are ranging from the smallest 3350mAh "lipstick" designs through to a 30,000mAh pack that's suitable for recharging laptops as well as phones and tablets. The larger capacity, the more you'll be able to recharge your device without having to pump it up with more power. That's an easy rule to follow, so the smallest Aukey is only likely to recharge a phone once while the largest will be able to recharge a variety of devices multiple times. Like most of the competition, some Aukey power banks come with multiple USB ports so you're able to recharge a variety of devices at the same time. Most larger power banks come with the ability to charge two devices. One interesting thing to note is how your battery pack can be recharged. Often power banks only use USB-C or microUSB to recharge, but a variety of Aukey devices also have the option to pump it up with a Lightning cable instead. That's the cable that exclusively recharges Apple products like an iPhone or iPad, so it's especially good if you only own Apple devices and you don't want to carry an additional charger. Some power banks also come with fast charging technology using Qualcomm Quick Charge 3.0, but you'll need to know for certain your device supports that tech for it to work. Only some Aukey power banks have that ability, so that's something to look out for in a description when you're looking over your device. At the moment, Aukey doesn't offer any special features like embed charging cables or wireless charging on any of its devices. 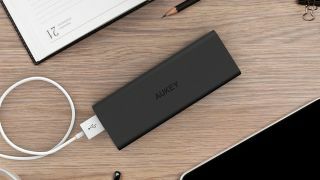 Aukey is one of the more affordable brands in the power bank space, and that can make them one of the most attractive when you're shopping around for a phone accessory. The devices aren't always the cheapest you'll be able to find, but that's largely as there are a lot of smaller brands we haven't used before so we'd usually recommend trying the Aukey for a little bit extra instead. While an Anker 20100mAh power bank costs $49.99 / £32.99 / AU$89.95 at the time of writing, an equivalent 20000mAh Aukey device costs $33.99 / £19.99 / AU$69.95. That means it's definitely worth looking around at our best power bank guide, but if you're purely after one of the cheapest option for a new power bank you'd be hard pressed to go wrong with something from Aukey.